The new 2018 version of FirstWare IDM-Portal ProEdition focusses even more on user-friendliness. The ProEdition 2018 release distinguishes itself with clear, intuitive web interfaces which make it even more convenient to use for non-IT-qualified employees. As a helpful feature, all the field descriptions used are adjustable to the company’s internal wording. Our user driven approach defines everything – with big advantages for your employees such as simple usability and immediate access to all data while reflecting the exact set of rules and permissions. The focal point of the 2018 version is the simplicity and usability of the IDM-Portal for the end user. Too many features can often make an application more confusing to work with. The number of functions used have been kept to a minimum with ease of use foremost in mind. Using guidance from feedback received from many of our customers, devices, groups and contacts are now even easier to manage with IDM-Portal ProEdition. Many functions can be flexibly adjusted. Special features for automation can be included via PowerShell scripts and templates. All of this without overwhelming users with a large number of new buttons and choices. Employees who don’t have an IT-background can take care of user management tasks without much instruction. ProEdition continues to create great demand and is used by companies of all sizes and across industries. Feedback and special requests from our customers are used for continuous improvement and are regularly implemented in software updates. 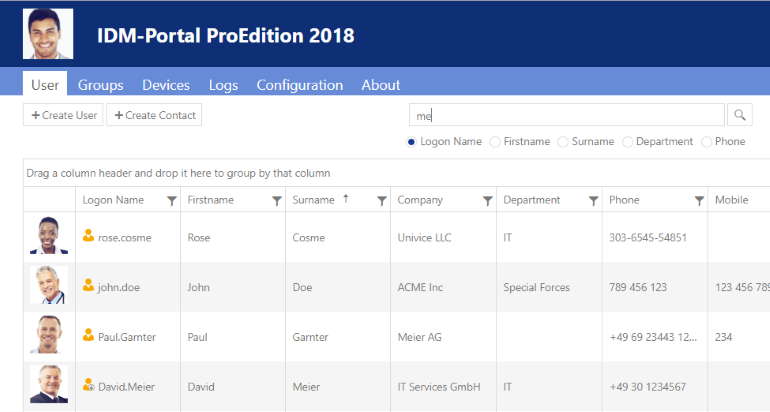 The new IDM-Portal ProEdition 2018 offers useful interfaces which can be connected to other systems. Essentially, IDM-Portal uses data providers, for example for PowerShell. These data providers are in many ways more flexible than classic connectors. IDM-Portal works without its own database, instead it uses your existing infrastructure. There are many possibilities, e.g. it can use your existing AD, other directories or a database. Classic Identity Management Systems use connectors which need to be extensively configured and maintained to access their database. In summary, IDM-Portal does not come with its own database – and it does not offer 40, 60 or 80 specific connectors. Instead, data providers take on the tasks of interfaces. The automation of processes can be achieved very quickly with the help of PowerShell, dynamic attributes and templates. Another new and powerful option is the software application FirstWare IDM-Automation which opens up a variety of possibilities. With IDM-Automation processes can be automated in the background, completely separate from IDM-Portal. This can include workflows, synchronisations or time controlled activities. Of course, IDM-Automation can be perfectly combined with IDM-Portal ProEdition. FirstWare IDM-Portal 2018 now includes several significant changes in its source code. These changes were necessary to improve the stability, configuration and implementation times of the software application. Additionally, IDM-Portal offers a wider range of customisations so that individual customer requests can be implemented even faster than before. Whatever companies want to achieve, IDM-Portal has been optimised to adapt to each customers’ individual goals. From an intranet phone book to a comprehensive access rights management tool, IDM-Portal can be adjusted with customised features and a corporate look and feel. 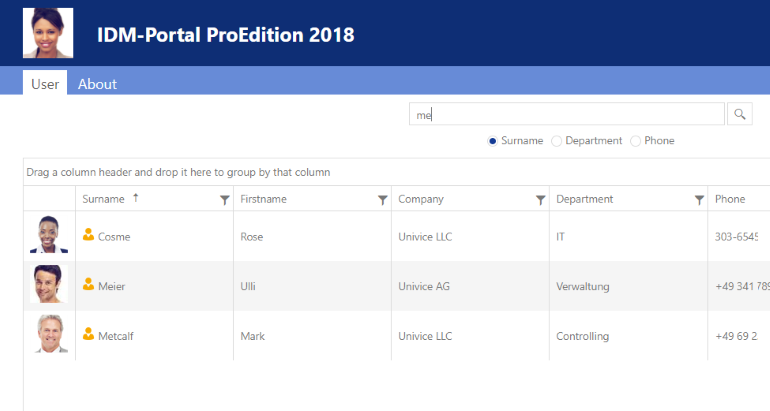 FirstWare IDM-Portal ProEdition 2018 includes a number of bugfixes from the previous version.